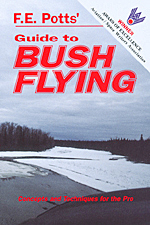 Fall is one of the busiest and most profitable seasons for the professional bush pilot. There are sheep, moose, and bear hunters wanting transportation to and from their hunting camps; miners and summer scientists needing to close down their mines and scientific outposts until spring; and trappers needing to get supplies in for the long winter. The season also brings steadily shortening days, along with low clouds, snow squalls, freezing rain, and high winds. In dealing with these problems, use the techniques described earlier. It should be noted that some of the nicest flying weather comes during this time of year. You can expect an Indian Summer during September that lasts from two to three weeks, bringing brisk mornings and clear calm sunny days. Then it is suddenly over, the weather changes, winter arrives, and stillness, like the now-falling snow, settles over the land.